A Wednesday evening in Istanbul. Walking the hip alleys of Karaköy, enjoying a coffee and some conversation at Karabatak cafe. On my way back to the ferry -- which is a regular form of transportation for me now -- I stumbled upon a sort of impromptu Çaycısı (chai cafe) with fresh seafood along the Bosphorus at Karaköy pier, near the fish market, just west of the Galata Bridge. This is definitely a thing. Istanbul is so alive all the time, even the middle of the week. The energy here is palpable. And the air, though often humid in the summer, makes me feel truly awake, as if I have been sleeping my whole life until now. Perhaps I will move here and drink çay by the sea every day. In the Turkish alphabet "ç" makes the sound "ch," thus çay is pronounced chai. Practice the Turkish alphabet before coming to Istanbul: it helps a lot. I say this because you will definitely want to come to Istanbul. For instance, all the food served anywhere in this city, from fancy restaurant to street food, is incredibly delicious. The quality of ingredients is exceptional and you will taste it immediately. Here at the pier, street vendors are selling fresh fish sandwiches with herbs, ground chili pepper, fresh tomatoes, peppers, onions, and lemon juice called balık ekmek for no more than 5 Turkish Lira (TR), only about $2.50. Do not worry, those fishermen you see along the pier are hobbyists, the fish is sourced from cleaner waters than the Bosphorus. 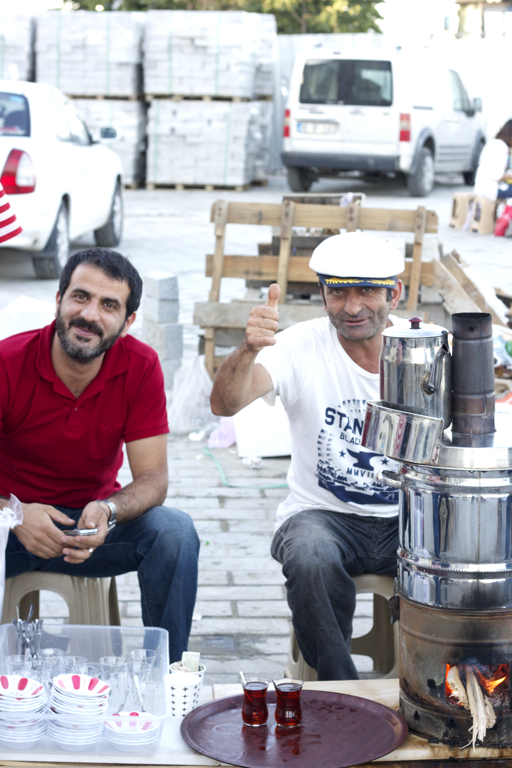 A three-man operation is handing out çay for free. Be sure to say teşekkürler and tip these men: reward kindness. When I ask to take their picture they pose instantly, no questions asked. In fact, most people here are glad to have their photos taken. Remember: this is a great way to make friends. June 27, 2014 by sara leana.